Krisy Elrod was working towards her PhD while also working several jobs, and still managed to lost 11.5lbs in 12 months and PR on all of her lifts! She was a star client, and has some great insights for anybody considering making nutrition changes and hiring a Beyond Macros coach. Check it out below! My biggest issue in the last year was that I was traveling so much for work, pleasure, and family. I counted it up and I was gone more than 90 days last year. I was having such a hard time staying on track with stuff. 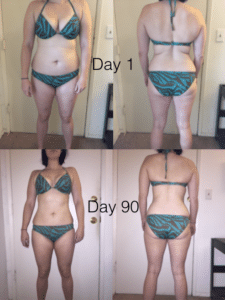 At the beginning of last year I made a goal to lose fat and feel better, and it was hard to figure out what to do. I was able to keep it together the days I was home, then I’d go out of town, things would come up and I couldn’t get on a routine I could utilize all the time. I found myself bouncing around going back and forth not knowing what to do and things got worse actually, I gained weight last year. I thought it was crazy, how was I doing the exact opposite of what I was trying to do? It was mostly because I didn’t have the tools to figure out what I wanted to do while living the life that I do. Time. I work several jobs and I’m still in my doctorate program, so time to organize and plan food was always difficult. How do I have time to go to the grocery store, cook enough food, and plan ahead to make sure its ready when I need it? I was always busy, always running around and that meant I either had no food options, or resorted to a last minute option. So planning ahead and having the time to organize was hard. Travel definitely didn’t go away, but coach Raye was helpful to break things down into bite sized actions to add in each week based on what was going on with me and my schedule. If she heard I had travel coming up, and I was nervous about it and the restricted food options, she would give me one useful nugget of information to use going forward and if I could just focus on that one thing, it was helpful. It wasn’t too much information at once, but it was always practical and doable based on the information I gave her. Even though the obstacles didn’t go away I learned ways to work around them. Same with planning and time, she gave me good information about how to prepare and plan ahead. Since my macros mostly stayed the same I got better at knowing how to hit them. Since I was more dialed in, I didn’t need more time to figure it out. That it wouldn’t be doable, or it would doable and not sustainable. I was worried I could do it with the help, but it wasn’t something I’d be able to maintain. That’s not how I view it anymore, I think its really realistic. When did you realize it was working? Definitely around Thanksgiving. That was a worry of mine, knowing that I had a lot of travel and the holidays coming up when we started, and thinking I’d feel deprived. I talked to Coach Raye and she said, ‘do Thanksgiving, thats your day, eat what you want and make sure to be on track before and after.’ It was nice to work in stuff, like holiday meals, that are important to me instead of being told, ‘good luck here’s your macros, hit them and we’ll figure it out.’ I was excited that things that are important to me were built in to the process. What helped make the nutrition habit changes you worked on be sustainable? I think knowing that I never felt hungry or deprived on a regular basis. Thinking about it as a diet has a negative connotation. Tracking how I felt was really helpful. I realized, I feel normal, I don’t feel low energy, I feel really great and that part of the tracking sheet made me realize, ‘I feel good.’ Not like a weird, ‘I eat salads all the time and feel so great’ type of person. I eat normal food, and I am losing weight! What has stuck with you after completing the program? The importance of protein is still a lesson I’m learning, but it will stick with me. It helps with my strength and other stuff thats important to me. It helps me not just with one goal, but a lot of others I have. Even just the experience of tracking my food, it showed me the appropriate amount to eat, what a portion size looks like, I can’t unlearn that. I’ve done it for so many days and I KNOW THAT now! In a supportive way, trust the process. There were times where I felt frustrated that I wasn’t seeing the scale move even though I was doing everything I was supposed to do but overall it worked out in the end because my body adjusted. I think its important to trust the process because its a gentle one, its not a crash diet, its not a huge crazy thing intended for big things to all happen at once, but its important to let it do its job at its own pace. What other results and benefits did you experience? The most important to me is that I have lost fat and changed my body. Looking at pictures for the beginning to now I have changed shape, and thats great. It was also important to me that I didn’t lose strength, and I actually got stronger in the process. I’ve been PR’ing everything in the last 3 months. And that I feel confident in making food choices. That was something I did not have before.